You all know it, the real estate profession is a long-term game, which means you need to create and maintain relationships, give value to your network. You need to embrace the “give, give, give” mentality. Time and time again, I ask you to trust the process and think big – think long-term. That’s the secret sauce. No one person is better than the other. Those on the top work harder and longer, don’t get discouraged by rejection, and know that they will be successful. You will see there are a lot of new names in Q3’s Top 25. This is so exciting! You know what that means? None of you can be complacent. Current success does not guarantee future success. If you are not learning and growing every single day, you need to reflect, plan and execute. I saw the way you all worked and I am very proud and ecstatic for what the future holds for you and JohnHart. This past quarter we added new agents, new staff, announced our commercial division, just finished construction on a new office, and are close to completing another one! If you’re on this list, congratulations! You deserve it. 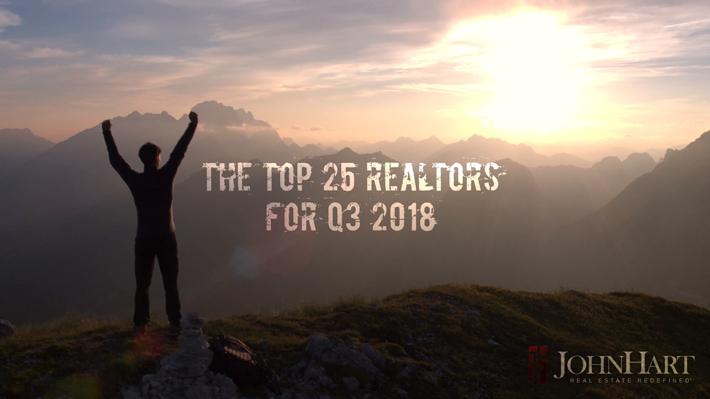 If you’re not on this list, use it as motivation to go into Q4 with everything you have and more. Put yourself in uncomfortable situations. Do things you haven’t done before. IT WILL PAY OFF!